In biology or human geography, population growth is the increase in the number of individuals in a population. Many of the world's countries, including many in Sub-Saharan Africa, the Middle East, South Asia and South East Asia, have seen a sharp rise in population since the end of the Cold War. The fear is that high population numbers are putting further strain on natural resources, food supplies, fuel supplies, employment, housing, etc. in some of the less fortunate countries. For example, the population of Chad has ultimately grown from 6,279,921 in 1993 to 10,329,208 in 2009, further straining its resources. Vietnam, Mexico, Nigeria, Egypt, Ethiopia, and the DRC are witnessing a similar growth in population. The sometime fierce disputes that his publication provoked around the "McKeown thesis", have overshadowed his more important and largely unchallenged argument that curative medicine measures played little role in mortality decline, not only prior to the mid-20th century but also until well into the 20th century. Although the McKeown thesis has been heavily disputed, recent studies have confirmed the value of his ideas. His work is pivotal for present day thinking about population growth, birth control, public health and medical care. McKeown had a major influence on many population researchers, such as health economists and Nobel prize winners Robert W. Fogel (1993) and Angus Deaton (2015). The latter considered McKeown as "the founder of social medicine". A positive growth rate indicates that the population is increasing, while a negative growth rate indicates that the population is decreasing. A growth ratio of zero indicates that there were the same number of individuals at the beginning and end of the period—a growth rate may be zero even when there are significant changes in the birth rates, death rates, immigration rates, and age distribution between the two times. A related measure is the net reproduction rate. In the absence of migration, a net reproduction rate of more than 1 indicates that the population of females is increasing, while a net reproduction rate less than one (sub-replacement fertility) indicates that the population of females is decreasing. Most populations do not grow exponentially, rather they follow a logistic model. Once the population has reached its carrying capacity, it will stabilize and the exponential curve will level off towards the carrying capacity, which is usually when a population has depleted most its natural resources. = the carrying capacity of the population; defined by ecologists as the maximum population size that a particular environment can sustain. is the initial population at time 0. Estimates of population evolution in different continents between 1950 and 2050 according to the United Nations. The vertical axis is logarithmic and is in millions of people. In 2017, the estimated annual growth rate was 1.1%. 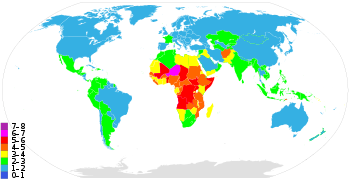 The CIA World Factbook gives the world annual birthrate, mortality rate, and growth rate as 1.86%, 0.78%, and 1.08% respectively. The last 100 years have seen a massive fourfold increase in the population, due to medical advances, lower mortality rates, and an increase in agricultural productivity made possible by the Green Revolution. The annual increase in the number of living humans peaked at 88.0 million in 1989, then slowly declined to 73.9 million in 2003, after which it rose again to 75.2 million in 2006. In 2017, the human population increased by 83 million. Generally, developed nations have seen a decline in their growth rates in recent decades, though annual growth rates remain above 2% in poverty-stricken countries of the Middle East and Sub-Saharan Africa, and also in South Asia, Southeast Asia, and Latin America. In some countries the population is declining, especially in Eastern Europe, mainly due to low fertility rates, high death rates and emigration. In Southern Africa, growth is slowing due to the high number of AIDS-related deaths. Some Western Europe countries might also experience population decline. Japan's population began decreasing in 2005; it now has the highest standard of living in the world. The United Nations Population Division projects world population to reach 11.2 billion by the end of the 21st century, but Sanjeev Sanyal has argued that global fertility will fall below the replacement rate in the 2020s and that world population will peak below 9 billion by 2050, followed by a long decline. A 2014 study in Science concludes that the global population will reach 11 billion by 2100, with a 70% chance of continued growth into the 22nd century. According to United Nations population statistics, the world population grew by 30%, or 1.6 billion humans, between 1990 and 2010. In number of people the increase was highest in India (350 million) and China (196 million). Population growth was among highest in the United Arab Emirates (315%) and Qatar (271%). Many of the world's countries, including many in Sub-Saharan Africa, the Middle East, South Asia and South East Asia, have seen a sharp rise in population since the end of the Cold War. The fear is that high population numbers are putting further strain on natural resources, food supplies, fuel supplies, employment, housing, etc. in some of the less fortunate countries. For example, the population of Chad has ultimately grown from 6,279,921 in 1993 to 10,329,208 in 2009, further straining its resources. Vietnam, Mexico, Nigeria, Egypt, Ethiopia, and the DRC are witnessing a similar growth in population. * Eritrea left Ethiopia in 1991. † Split into the nations of Sudan and South Sudan during 2011. ‡ Japan and the Ryukyu Islands merged in 1972. # India and Sikkim merged in 1975. 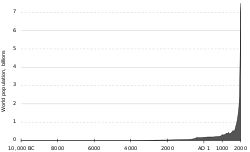 Estimated size of human population from 10,000 BCE to 2000 CE. According to the UN's 2017 revision to its population projections, world population is projected to reach 11.2 billion by 2100 compared to 7.6 billion in 2017. In 2011, Indian economist Sanjeev Sanyal disputed the UN's figures and argued that birth rates will fall below replacement rates in the 2020s. According to his projections, population growth will be only sustained till the 2040s by rising longevity, but will peak below 9 bn by 2050. Conversely, a 2014 paper by demographers from several universities and the United Nations Population Division projected that the world's population would reach about 10.9 billion in 2100 and continue growing thereafter. One of its authors, Adrian Raftery, a University of Washington professor of statistics and of sociology, says "The consensus over the past 20 years or so was that world population, which is currently around 7 billion, would go up to 9 billion and level off or probably decline. We found there’s a 70 percent probability the world population will not stabilize this century. Population, which had sort of fallen off the world’s agenda, remains a very important issue." ^ "World Population Prospects 2017". Retrieved 2017-11-21. ^ "World Population Prospects: The 2017 Revision: Key Findings and Advance Tables" (PDF). United Nations Department of Economic and Social Affairs, Population Division. p. 2. Retrieved 2019-01-05. ^ Population Reference Bureau. "2013 World Population Factsheet" (PDF). www.pbr.org. Population Reference Bureau. Retrieved 5 December 2014. ^ McKeown, Thomas (1976). The Modern Rise of Population. London, UK: Edward Arnold. ISBN 9780713159868. ^ a b McKeown T, Brown RG (1955). "Medical evidence related to English population changes in the eighteenth century". Population Studies. 9 (2): 119–141. doi:10.1080/00324728.1955.10404688. JSTOR 2172162. ^ McKeown T, Record RG (1962). "Reasons for the Decline of Mortality in England and Wales during the Nineteenth Century". Population Studies. 16 (2): 94–122. doi:10.2307/2173119. JSTOR 2173119. ^ Korotayev, A. V.; Malkov, A. S. (2016). "Compact Mathematical Model of the World System Economic and Demographic Growth, 1 CE–1973 CE". International Journal of Mathematical Models and Methods in Applied Sciences. 10: 200–209. ^ Deaton, Angus (2013). The Great Escape. Health, wealth, and the origins of inequality. Princeton and Oxford: Princeton University Press. pp. 91–93. ISBN 978 0 691 15354 4. McKeown's views, updated to modern circumstances, are still important today in debates between those who think that health is primarily determined by medical discoveries and medical treatment and those who look to the background social conditions of life. ^ a b Reece, Jane; Urry, Lisa; Cain, Michael; Wasserman, Steven; Minorsky, Peter; Jackson, Robert (2014). Campbell Biology. Pearson. ^ Stewart, James; Clegg, Daniel (2012). Brief Applied Calculus. Brooks/Cole Cengage Learning. ^ a b "World Population Prospects 2017". Archived from the original on 2017-07-11. ^ "The World Factbook". 20 November 2015. Retrieved 4 January 2016. ^ "BBC NEWS - South Asia - The end of India's green revolution?". 2006-05-29. ^ "International Programs". Archived from the original on 2009-07-01. ^ "Japan sees biggest population fall". the Guardian. Associated Press. 2009-01-02. ^ a b Sanjeev Sanyal (2011-10-30). "Sanjeev Sanyal on The End of Population Growth - Project Syndicate". Project Syndicate. ^ Carrington, Damien (September 18, 2014). "World population to hit 11bn in 2100 – with 70% chance of continuous rise". The Guardian. Retrieved December 19, 2016. ^ a b "World Population Prospects - Population Division - United Nations". ^ a b c d e f g h i Department of Economic and Social Affairs Population Division (2009). "World Population Prospects, Table A.1" (PDF). 2008 revision. United Nations. Retrieved 2009-03-12. NB: The preliminary results of the National population census in Guinea-Bissau put the figure at 1,449,230, according to email information by the Instituto Nacional de Estudos e Pesquisa, Bissau. ^ a b c d e f g h i j k l m n o p q r s t u v w x y z aa ab ac ad ae af ag ah ai aj ak al am an ao ap aq ar as at au av aw ax ay az ba bb bc bd be bf bg bh bi bj bk bl bm bn bo bp bq br bs bt bu bv bw bx by 'Modern School Atlas (96th edition)', ISBN 978-1-84907-013-3. ^ Central Intelligence Agency (2009). "Niger". The World Factbook. Retrieved January 10, 2010. ^ "Mali preliminary 2009 census". Institut National de la Statistique. Archived from the original on April 18, 2010. Retrieved January 12, 2010. ^ Central Intelligence Agency (2009). "Senegal". The World Factbook. Retrieved January 10, 2010. ^ The World Factbook- Congo, Democratic Republic of the. Central Intelligence Agency. ^ a b "Central Agency for Population Mobilisation and Statistics — Population Clock (July 2008)". Msrintranet.capmas.gov.eg. Archived from the original on 2010-09-08. Retrieved 2010-08-25. ^ "Falkland Islands (Islas Malvinas)". The World Factbook. CIA. Retrieved 5 March 2010. ^ "Departamento Administrativo Nacional de Estadística". Dane.gov.co. Archived from the original on 2015-09-05. Retrieved 2010-08-22. ^ "INEGI 2010 Census Statistics". inegi.org.mx. Retrieved 2010-11-25. ^ Central Intelligence Agency (2011). "Nauru". The World Factbook. Retrieved 12 February 2011. ^ a b "The World Factbook". ^ "Population clock". Australian Bureau of Statistics website. Commonwealth of Australia. Retrieved 12 April 2011. The population estimate shown is automatically calculated daily at 00:00 UTC and is based on data obtained from the population clock on the date shown in the citation. ^ "IFs Forecast - Version 7.00-Google Public Data Explorer". ^ "Wzrasta liczba ludności Polski - Wiadomości - WP.PL". Wiadomosci.wp.pl. 2010-07-23. Archived from the original on 2013-10-05. Retrieved 2010-07-27. ^ Hungarian Central Statistical Office. Retrieved 25 July 2010. ^ "Total population at 1 January". Eurostat. 11 March 2011. Retrieved 29 April 2011. ^ "CSO – Population and Migration Estimates April 2010" (PDF). September 2010. Retrieved 21 September 2010. ^ "Statistics Bureau Home Page/Population Estimates Monthly Report". ^ "Provisional Population Totals - Census 2011". Indian Census Bureau 2011. Retrieved 2011-03-29. ^ "Time Series on Population (Mid-Year Estimates)". 31 Aug 2010. Statistics Singapore. 2010. Archived from the original on 2009-02-21. ^ Monaco, The World Factbook, Central Intelligence Agency. Retrieved 7 June 2010. ^ "Πίνακας 1. Πληθυσμός κατά φύλο και ηλικία" (PDF). National Statistical Service of Greece: Population census of 18 March 2001. Archived from the original (PDF) on March 25, 2009. ^ "Total population". Eurostat. 1 January 2010. Retrieved 8 January 2010. ^ Bevölkerungsstatistik 30. Juni 2009 Archived 2013-11-14 at the Wayback Machine, Landesverwaltung Liechtenstein. ^ "총인구, 인구성장률 : 지표상세화면". Index.go.kr. Retrieved 2010-10-29. ^ (in Korean) UNFPA (2009-10-01). "한반도 인구 7천400만명 시대 임박". United Nations. Archived from the original on 2010-04-17. Retrieved 2010-04-14. ^ "Brunei". CIA World Factbook. 2011. Retrieved 2011-01-13. ^ "Laporan Kiraan Permulaan 2010". Jabatan Perangkaan Malaysia. p. iii. Archived from the original on July 8, 2011. Retrieved 31 January 2011. ^ "Population and Housing Census 2000, National Statistical Office". Web.nso.go.th. 2000-04-01. Retrieved 2010-04-25. ^ "Central Intelligence Agency. March 2011 est". Cia.gov. Retrieved 2011-04-23. ^ "REMARKABLE GROWTH EXPATS OUTNUMBER BAHRAINIS IN 2010 CENSUS". Bahraini Census 2010. 2010-11-28. Archived from the original on February 19, 2011. Retrieved 14 February 2011. ^ "Population size and population composition". Swiss Federal Statistical Office. Swiss Federal Statistical Office, Neuchâtel. 2010. Archived from the original on 2016-06-28. Retrieved 2011-04-29. ^ "Population: 511 840 habitants au 1er janvier 2011", Le Portail des statistiques: Grand-Duché de Luxembourg, 3 May 2011. (in French) Retrieved 4 May 2011. ^ "Romania - Population". epp.eurostat.ec.europa.eu. Retrieved 26 May 2011. ^ "Niue". The World Factbook. Central Intelligence Agency. Retrieved 2009-07-20. ^ (in French) INSEE, Government of France. "Population totale par sexe et âge au 1er janvier 2011, France métropolitaine". Retrieved 20 January 2011. ^ (in Italian) "Monthly demographic balance: January–November 2010" (PDF). Istat. 28 March 2011. Retrieved 2 April 2011. ^ Anuario Estadístico de Cuba 2009. Edición 2010 Archived 2010-07-16 at the Wayback Machine, Oficina Nacional de Estadísticas, República de Cuba. Accessed on November 6, 2010. Note: An exchange rate of 1 CUC to 1.08 USD was used to convert GDP. ^ Pordata, "Base de Dados Portugal Contemporâneo". Accessed on March 7, 2011. ^ "Population Forecast to 2060 by International Futures hosted by Google Public Data Explorer". Retrieved 2011-07-13. ^ "Background notes - Laos". US Dept. of State. Retrieved 2011-01-20. ^ "Official Iranian Population clock". Amar.org.ir. Archived from the original on 2011-07-22. Retrieved 2011-07-13. ^ "Estimated population of Canada, 1605 to present". Statistics Canada. 6 July 2009. Retrieved 2011-04-17. ^ "Resident Population Data – 2010". U.S. Census Bureau. 2010. Archived from the original on 2011-10-28. Retrieved 2010-12-22. ^ Shackman, Gene; Xun, Wang; Liu, Ya-Lin (2012-06-10). "Brief Review of World Demographic Trends Summary". Elsevier. SSRN 2080860. ^ Gerland, P.; Raftery, A. E.; Ev Ikova, H.; Li, N.; Gu, D.; Spoorenberg, T.; Alkema, L.; Fosdick, B. K.; Chunn, J.; Lalic, N.; Bay, G.; Buettner, T.; Heilig, G. K.; Wilmoth, J. (September 14, 2014). 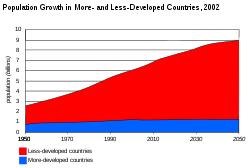 "World population stabilization unlikely this century". Science. 346 (6206): 234–7. Bibcode:2014Sci...346..234G. doi:10.1126/science.1257469. ISSN 1095-9203. PMC 4230924. PMID 25301627. Retrieved September 21, 2014. Rosling, Hans (25 January 2009). "What stops population growth?". Gapminder. Retrieved 2009-07-06. Nedelman, Michael (9 November 2018). "Fertility rates cut in half since 1950 -- but the population is still growing". CNN. Retrieved 2018-11-17.